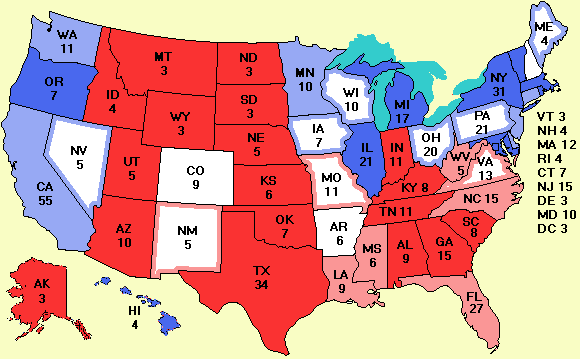 There are 48 new polls today in a total of 25 states. The bottom line is that Kerry is continuing to surge. He now has more than the 270 votes in the electoral college needed to be elected president. However, his margin is razor thin in many states. Still, this is a remarkable comeback. From the electoral college graph you can see how steep his rise has been. All of this gain is undoubtedly due to the first debate. Needless to say, tonight's debate will be extremely important for both candidates. 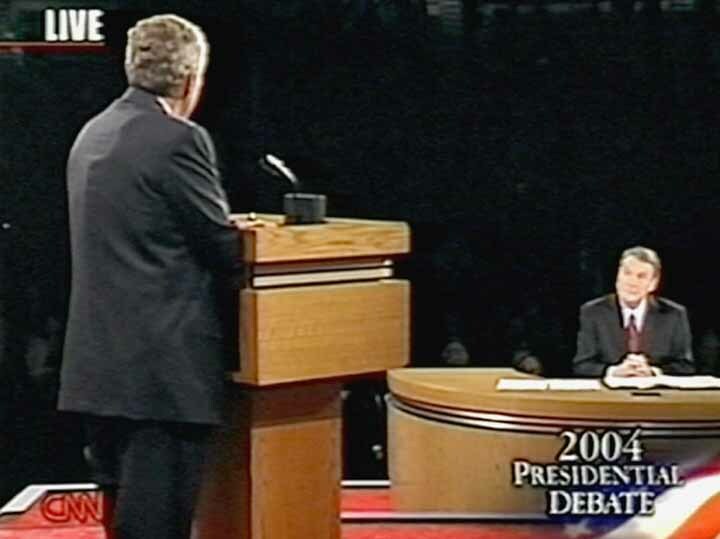 Salon.com reports that Bush had a radio receiver taped to his back during the first debate so he could receive messages via a tiny hearing-aid-like device in his ear. They back this up with a photo. I have no way of verifying the story, but the Commission on Presidential Debates has verified that one of the rules of engagement the Bush campaign insisted on was no camera shots of the candidates from behind (which one of the pool cameras did anyway). This story is either investigative journalism at its best or wishful thinking. If you are not a Salon.com subscriber, you have to sign up for a free day pass to read the full story. I obtained a copy of the debate video and the Red Hawk image intensification software (developed for NASA), which combines multiple images into a sharper image and then had the contrast enhanced with Photoshop. Other than cropping and resizing of the image, no other manipulation was done. I stand 100% behind the fact that this image was taken from the debate video, independently confirming the Salon.com photo, but interpretation is up to you. If you are interested in the site statistics, look at electoral-vote.com/stats. The most relevant column is the Visitors, but you have to add about 50-60% to compensate for caching at ISPs. When AOL, comcast, etc. fetches a page for the first time, it saves the page so it does not have to fetch it next time it is requested (usually by a different user). Thus the server knows nothing about the second user, and the Webalizer stats are built from the server logs.